Few people are untouched by the issue of disability, whether personally or through a friend or relative. 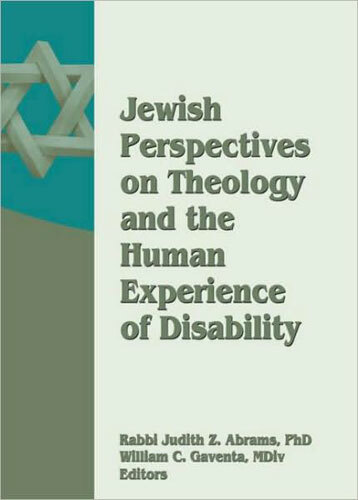 Jewish Perspectives on Theology and the Human Experience of Disability shares moving insights from around the world and across the broad spectrum of Judaism on how and why the Jewish community is incomplete without the presence and participation of the disabled. Authors representing each of the three main movements of Judaism—Orthodox, Conservative, and Reform—examine theology, scripture, ethics, practical theology, religious education, and personal experience to understand and apply the lessons and wisdom of the past to issues of the present. Authors from Israel, the United States, the United Kingdom, and Australia reflect on their theological understandings of specific disabilities and on disability as a whole. Jewish Perspectives on Theology and the Human Experience of Disability re-examines tradition, teachings, and beliefs to shatter stereotypes of Judaism and common interpretations of scripture. This unique book addresses several disabilities (blindness, deafness, intellectual disabilities, autism, learning disabilities), and a wide range of topics, including human rights and disabilities, Jewish laws concerning niddah, misconceptions about disabilities in the Hebrew Bible, Jewish community programs to include people with disabilities, and the need to educate American Jews about Jewish genetic diseases. Jewish Perspectives on Theology and the Human Experience of Disability also includes reviews of Judaism and Disability: Portrayals in Ancient Texts from the Tanach through the Bavil and Disability in Jewish Law, as well as comprehensive resource collections. This book is an essential read for clergy and lay leaders involved in the support of people with disabilities, for the families of people with disabilities, and for anyone working with the disabled.